On the 24th, Arikara moved to Lea, on the Solent to join the British tug fleet in preparing for the invasion of Europe. During the remainder of April and all of May, she towed to dispersal points on the southeastern coast of England portions of the two "mulberries," artificial harbors to be erected on the French coast after the initial assault to provide logistical support for the movement of all Allied armies inland. On 15 May 1944, she was reclassified a fleet tug and redesignated ATF-98. Throughout the period leading up to the invasion, Ankara helped to repel German air attacks; and, though near misses shook her considerably, she suffered neither hits nor significant damage from shell fragments. That phase past, the tug resumed salvage and towing work on the 7th. In all, she spent almost a month supporting the consolidation of the Normandy invasion. Though she came under air attacks and fire from shore batteries, her only major damage came from the explosion of a nearby mine while she was towingthe disabled French destroyer La Surprise back to England for repairs. Her main engine room rapidly took on water which rose to within six inches of her main electric motor before her crew managed to check the leaks. Ankara completed her mission successfully, and, after 24 hours of feverish activity, her crew had her repaired and back in action off Normandy. Early in July, Ankara and Pinto (ATF-90) received orders to return to England. From there, the two tugs set out on 12 July in a convoy bound for the Mediterranean coast of North Africa. Her convoy arrived at Oran, Algeria, on the 21st; but Arikara remained there only until the end of the month. She headed for Italy on 1 August, reached Naples on the 3d, and joined Rear Admiral Spencer S. Lewis' TF 87, code-named "Camel" Force, for the mid-August invasion of southern France. Staged through Ajaccio, Corsica, Ankara's unit, the force's salvage and fire-fighting group, arrived off St. Raphael on the Mediterranean coast of France on the morning of 15 August, the day of the assault. For more than a fortnight, the tug remained in the transport area, salvaging damaged ships and landing craft, fighting fires, and keeping the approaches to the beach clear of wrecks. On 2 September, she moved to the Gulfe de San Tropez, France, and began clearing wreckage from French Riviera ports. She also towed ships to Palermo, Sicily, where they underwent repairs. In addition, she made towing voyages to Naples, Marseilles, Bizerte, and Oran. Ten days later, she departed Ulithi as part of Task Group (TG) 50.8, the 5th Fleet Logistics Support Group, and headed for the Ryukyu Islands. To begin the campaign, during the last week in March, American forces took Kerama Retto, a small group of islands about 15 miles west of southern Okinawa. Then, on 1 April, the main assault force landed on Okinawa proper. 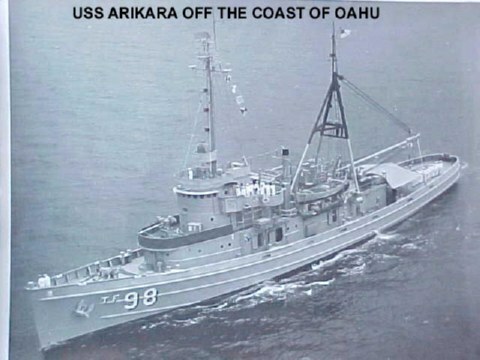 Arikara spent the next 11 weeks based at Kerama Retto assisting ships and craft damaged in the struggle for Okinawa. On the night of 2 April, the tug went to the assistance of Dickerson (APD-21) after that high-speed transport had suffered a devastating suicide crash from a Kawasaki Ki. 45 "Nick" twin-engine reconnaissance/ground attack aircraft. Ankara's crew managed to extinguish the fires raging on board Dickerson, and the tug took her in tow for Kerama Retto. In spite of Ankara's efforts, Dickerson proved to be beyond economical salvage and was towed out to sea on 4 April and sunk. Although Ankara's main mission at Okinawa was the removal and salvage of damaged landing craft, kamikaze attacks continued to add to her burdens. On 11 May, a horde of suicide planes attacked Evans (DD-552) andHugh W. Hodley (DD-774) on picket station no. 15 to the northwest of Okinawa. Arikara sped to the aid of Evans, which had sustained four suicide crashes in rapid succession. Arikara moved alongside her, put five pumps on board, made fast a hawser, and towed the destroyer into Kerama Retto for repairs. Arikara performed salvage work in the Ryukyus well into June. On the 19th of that month, she took kamikaze-damagedEvans in tow and set course for the Marianas. The tug arrived at Saipan on 25 June and remained there until 11 July. From Saipan, she sailed to Leyte where she stayed through 18 August when she got underway for Japan. The tug stopped at Okinawa before proceeding on to Kyushu. She returned to Okinawa briefly in September and then continued on to the Philippines. On 9 October, while still en route to Leyte, the ship weathered a severe typhoon. After reaching Subic Bay, she underwent repairs until getting underway late in November for China. Upon reaching Tsingtao, Arikara began towing and salvage work in support of occupation forces. Late in 1964, American involvement in the conflict in SouthVietnam increased dramatically. As a consequence, Ankara began to visit the Vietnamese coast more frequently. By the fall of 1966, the tug found herself calling at such places as Vung Tau and Danang to provide towing and other support services for Navy units engaged in fighting communist insurgency and North Vietnamese aggression in South Vietnam. Her deployments to Asian waters along with the concomitant service in Vietnam continued into 1970. Late in February of that year, Ankara returned to Pearl Harbor from her final tour of duty with the 7th Fleet. She served actively in the Hawaiian Islands and in Alaskan waters for another 16 months. On 1 July 1971, the tug was decommissioned and simultaneously transferred to Chile as a loan under the military assistance program. She was commissioned in the Chilean Navy as Aldea (ATF-63). As of 1 July 1986, Aldea was still active with the Chilean Navy.